Normal Town Council member Kathleen Lorenz won re-election Tuesday. She was endorsed by Mayor Chris Koos. Stan Nord and Karyn Smith were elected Tuesday in an eight-way race for three spots on the Normal Town Council, unseating incumbent R.C. McBride. Incumbent Kathleen Lorenz was re-elected to a second term. Nord and Smith campaigned side-by-side, raising concerns about the town’s work with private developers, including the financial incentives used to jumpstart projects in Uptown Normal. They also accused town leaders of not taking seriously the concerns of critics. Koos endorsed Lorenz, McBride, and Normal Planning Commissioner Dave Shields. Koos said any surprise in Tuesday’s results stems from the high number of candidates. In addition to the eight on the ballot, write-in candidate Karl Sila campaigned with Nord and Smith. “There was a lot of vote-splitting from what I can see,” Koos said. He said McBride, a former Democratic precinct committeeman and GLT's general manager, was most impacted by the vote-splitting. Also in the race were the progressive trio of Pat Turner, Joel Studebaker, and Alex Campbell, who campaigned side-by-side and watched results together Tuesday night. There are seven members of the Normal Town Council, including Koos. 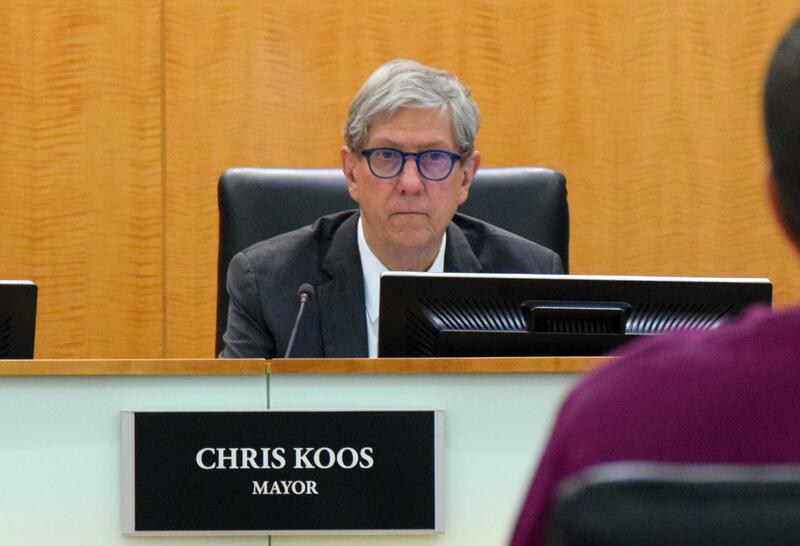 GLT's interview with Normal Mayor Chris Koos. Meanwhile, the Bloomington City Council will have four new aldermen starting next month: Donna Boelen, Julie Emig, Jenn Carrillo, and Jeff Crabill. Carrillo defeated incumbent Alderman Karen Schmidt in Ward 6; three other incumbents chose not to seek re-election. Mayor Tari Renner said Tuesday’s results don't reflect any overarching theme. He said voters in different wards were making different statements, but it will lead to a changing of the guard at City Hall. Renner said the new aldermen are invited to a city council retreat later this month to help chart a course for the city's future. Six incumbents won re-election to the Unit 5 school board Tuesday, with two recent appointees fending off a challenge from a former district employee. Local election authorities weren’t expecting a big turnout Tuesday. And they didn’t get one.